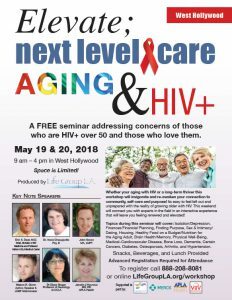 Please join Mason on Sunday afternoon in West Hollywood, CA, May 20th, 2018 from 1:30PM to 2:45PM as he helps lead a conversation on love and embracing community, especially within HIV+ men of a certain mature age. All are welcome to hear the advice, which can be applied to any age or walk of life. Mason and the featured guests will have an informal chat to see how one can navigate darkness through the difficult period of a gay man’s life where he can feel more isolated and lonely. Please utilize the link to fill out the form for your FREE RSVP, where the event address will be disclosed. Attendees are encouraged to attend the entire weekend, but can also only attend the seminar that Mason will help lead. Snacks, beverages, and lunch will be provided.